In the last few years we all have seen sudden growth of internet usage, companies are using internet to its extend, which ultimately helps them to cut the cost and now they are able to reach their customers or members easily. According to Ovum, spending on web conferencing will grow by more than 18 percent annually over the next five years. Another thing which attracts our attention is that not only big companies are spending on audio, video conferencing, but even SMEs are also looking forward to it. InterCall is the world’s largest dedicated conferencing service provider, connecting people through advanced audio, web, video and event services. InterCall offers telephony, messaging, conferencing and collaboration tools for businesses of all sizes, from large global enterprises to small or regional companies. With a global footprint and broad service capabilities, InterCall’s flexible models for hosted, managed and on-premises communication services help companies get the most out of their business processes. 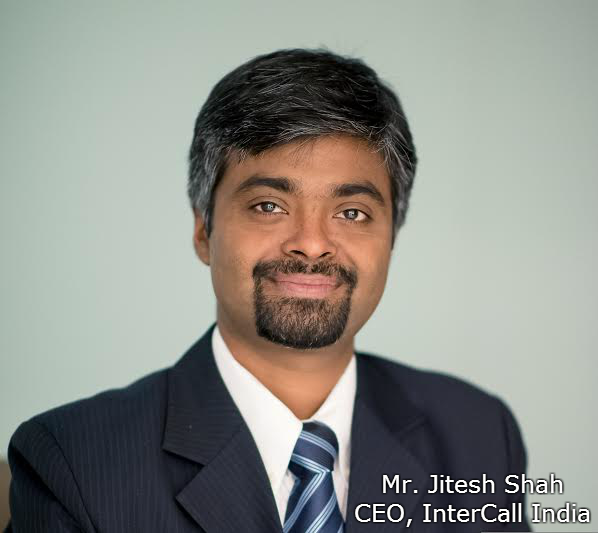 TechnoArea got some precious time with Mr. Jitesh Shah, the CEO Of InterCall India and he share how InterCall is doing in Indian market and what he see in Indian market for InterCall. When InterCall was founded in the early 1990s, landline phone capabilities were limited. InterCall began delivering conferencing platforms, connecting three or more people to a single call as the work-from- home movement and wireless boom expanded the numbers of remote workers and the need for conferencing; however, conferencing services were not yet widely used. The dot-com era provided a welcome bump in awareness and usage. InterCall was at the forefront, debuting reservationless audio conferencing in 1999 and web conferencing in 2000. Conferencing technology began to be recognized as a cost- effective means of improving productivity and connecting employees across zip codes and time zones. Conferencing changed forever on September 11, 2001. Businesses across the world turned to conferencing when they were unable or unwilling to travel. Companies found they could be productive without the fear or inconvenience of post-9/11 travel. As the travel industry recovered, the conferencing industry did something that surprised even the experts—it continued to grow. The conferencing and collaboration industry is now a $6.2 billion global industry, and is forecasted to grow to $8 billion by 2015. The reason for the industry’s continued growth is simple: workers are becoming more mobile and companies continue to look for easier ways to get more done. Conferencing providers help businesses achieve both. The next frontier for collaboration lies in solutions that deliver services such as conferencing, email, messaging and voice from one central location. InterCall and our parent company, West Corporation- a leading provider of technology-driven communication services embrace this change and work towards bringing new forms of communication to the forefront every day. InterCall is currently the #1 and largest conferencing service provider in virtually every major market around the globe. Through acquisitions, product development and strategic partnerships, InterCall and West have become leading contenders in the Unified Communications (UC) space—offering hosted and managed solutions that are transforming the way companies work. India represents a key growth market for us and at the group level there is a 100% commitment in catering to our customers India specific needs. We have established strong presence in the top cities in India and we are now looking in to other cities too along with appropriate delivery models. West Incorporation is our parent company and they have a broad range of products and services apart from what we currently take to market in India. InterCall is committed to R&D and is continuously improving its product and service portfolio to meet customers’ changing needs. This will help us add more momentum to our current expansion plans. A lot of focus this year will be towards strengthening our partner model. For the benefit of our customers we have always focused on the 2 I’s – Infrastructure and Interface. We have maintained our market leadership by providing the best infrastructure and a quality of service to our customers in India. Along with providing best in class infrastructure, we also focus a lot on the other ‘I’, which is interface. We also do not follow the ‘one size fits all’ strategy. InterCall’s customers are enterprises and SMBs, we offer solutions that can drive business outcomes and efficiencies, and improve business process. Understanding that our customers today who have a fairly young working age population and given the desire of these customer’s staff to have relevant, cool and special apps that help them collaborate easily, providing a sleek and well-designed interface is a big motivator for us. Through our focus in these areas, we strongly believe we will continue to outpace the industry growth like we have done in the past. This will further help us solidify and expand our market share in India. We are targeting to grow our market share in India. We also want to further build on the great start we have had with new service offering and grow aggressively these market adjacencies like digital media. This is InterCall’s 10th year in India. We have grown phenomenally in these last 10 years and will only strengthen more from here on. Conferencing and collaboration is a significant growth industry in India. The growing appetite of customers, opening up of new age verticals and the growing adoption of technology in the older industries will help propel growth in this space. For example, in the past IT and ITES, BFSI and Pharma sectors have been the largest consumers of our products and services. We are now beginning to see success with our customers in the manufacturing, and engineering space too. Q2. To whom does InterCall’s services appeal more to,”the casual users or the corporate guy” ? InterCall’s solutions are focused on helping large enterprises and SMBs achieve their business goals. InterCall works with a number of start-ups and SMBs and as a company that offers UCaaS, we provide them a solution that is appropriate to their requirements. This cloud-based solution enables SMBs to deploy a unified communication strategy without investing capital in on-site hardware or budgeting for continual operational expenses, since the third-party provider supplies, manages and hosts the required infrastructure. InterCall has been working with a number of large enterprises around the world and conducts business with 83 of 100 Fortune companies, support more than 65,000 organisations and over 2.9 M unique conference leaders and hosted over 148M conferences in 2013 globally. InterCall has clients across IT and ITES, BFSI and Pharma sectors and is now beginning to see success with customers in the manufacturing, and engineering space too. Q3. Apart from corporates, are you planning to extend your services to individuals? InterCall has been conducting business with large enterprises and SMBs for over 20 years now and we take pride in being the leading UC provider in the world and across all regions. We are currently working with our customers to help them improve their business processes and achieve their desired business outcomes. As a global leader in UC, we intend to leverage our strengths and continue doing what we do best while maintaining our market leadership position. Q4. What are the industries that are likely to gain benefit from your application? Businesses from all industries can benefit from InterCall’s solution. Again, this boils down to InterCall’s “no one size fits all” approach to customers. InterCall spends more time on the consultation phase, talking to the customer and analyzing what their business needs are. So InterCall is able to provide solutions that would drive the customers’ business outcomes and address their specific needs. We have customers across many different industries and cater different solutions for different needs. Q5. How you see Indian market coming around in future? SMEs with multiple office locations prefer cloud-based solutions as they can be rolled out easily and are supported by the cloud provider’s IT services. The key growth areas which have emerged are India, Australia, South Korea and Singapore. According to IDC, within major industry verticals, cloud-based UC adoption continues to grow the fastest in retail, education, health care, hospitality and professional services. The Indian market has shown particularly strong growth for the past few years and is predicted to continue to be one of the fastest growing countries in Gartner’s cloud forecast. IT spending on public cloud services in India is expected to reach USD 1.4 billion in 2017 and this offers great opportunity to InterCall. Audio minutes, the primary mode of business communication, are increasingly being replaced by video. Just like interviews, business leaders consider visual cues to be an important part of business communication. They are realising the importance of the need to maintain face-to-face relationships with partners, suppliers and vendors. As the technology behind video conferencing continues to mature, data packets flow will improve. This has made video more feasible for conferencing. One-way or two- way video support for customer engagement of complex support issues is one of the key areas which would be impacted by this movement. The VC market is expected to grow from $146 million in 2013 to $299 million by 2018 for India. Newer strategies continue to emerge and 2014 will be a big year for WebRTC – web browser-based real-time video conferencing efforts. Adding a video element to the UC story and addressing interoperability will be a big move giving customers more choices to evaluate and more challenges to address. The rise in interest and availability of VCaaS option using a cloud infrastructure that serves more and newer devices is helping reshape the overall videoconferencing market. Three of the most well-known names in information technology, Cisco, Google and Microsoft have a strong market presence in conferencing and collaboration services. IT managers are utilising Cisco’s, Google and Microsoft’s ecosystems together for different functions and departments. Merging them together allows organisations to effectively “sweat” the existing asset and still use their investments in legacy systems for a while longer. Regulations surrounding telecommunications services and governance on voice-over-IP (VoIP) have hampered the entry of global service providers into countries like India and China.Recently, regulatory bodies are embarking on extending telecom services licenses to qualified third-party IT service providers. This has allowed service providers to leverage on the existing infrastructure of telecom companies and provide services backed by high-level service level agreements (SLAs) to customers. We would see an increase in the establishment of joint ventures and strategic partnerships with local service providers, resulting in a larger market presence of global/regional service providers in these tightly- regulated countries. In 2015, advancements in UC solutions will offer even greater benefits to organisations, promising continued growth in its adoption, evolution and deployment. With the easing of restrictions in the emerging markets of India and China plus the building out of infrastructure in ASEAN emerging markets creates new and exciting avenues for growth. Q6. Who are your biggest competitors and how is InterCall different from them? The conferencing and collaboration market in India has grown over the last couple of years. There are currently a number of market players in the industry, which makes the competition very stiff. InterCall has always stood out from its competitors through its approach towards serving its customers. InterCall integrates customers’ existing solutions with new technology to create a single interface that benefits the end user. InterCall is the world’s largest dedicated conferencing service provider helping companies to enhance communication with colleagues, business partners & customers through advanced audio, web, video and event services. With a global footprint and broad service capabilities, InterCall’s flexible models for hosted, managed and on-premises communication services has helped companies in India get the most out of their business processes. Not only do InterCall’s applications bring productivity improvements for mobile employees, they have also favorably changed ways in which all employees communicate as well as reduce the necessity of travel. As an industry leader, InterCall is at the forefront of developing new products and solutions that address customers’ changing needs. This is also in line with InterCall’s commitment to provide solutions that will help customers achieve desired business outcomes. InterCall has a strong partner program. We believe in acting as the one stop shop for our customers’ needs in India. Depending on whether a customer is a Cisco house, Microsoft house, Google house or an independent house, our strategically aligned services and products allow us to position our products and services which integrate via native apps within the customer’s incumbent network and IT strategy. We also have a partner engagement with Reliance Communications via which we are able to make further inroads in to the Indian market and cater to our domestic customers. Since we have a lot of our own proprietary solutions, it helps us engage in a strategic manner with our partners and there is constant value addition from both sides in our relationships with our partners. Q7 What are the facilities being offered by InterCall ? InterCall is in the business of providing a highly integrated global Software as a Service (SaaS) platform for Unified Communications and Collaborative services to our customers in India. We predominantly focus on two types of customers in India. One is our global customers who have a need for our services in India. And the other is customers that are acquired by our direct and channel sales teams. Aimed at fulfilling our customers’ needs in this space, we provide an advanced platform that covers audio, web, and video conferencing and enterprise resilience technologies. In addition, we have a strong and well-designed integrated suite of products in the digital media space. This predominantly features live streaming events, which include web and video streams, archival solutions for our customers within their domains to view these on demand, network optimization tools to take our solutions to a large number of desk end points within our enterprise customer’s environments, and also providing virtual events. Our interface surrounding these new age products has helped us be very successful in this space in 2014 and we will continue to grow in 2015 on the back of this and our other core products. All of this will eventually lead to us continuing to increase our market share in India.